Valdemar Poulsen was an important inventor in many fields of electrical engineering, and is sometimes called the "Danish Edison." He was born 23 November 1869 in Denmark. Although he did not excel in all subjects in school, he was talented in physics and drawing. His father, a judge, urged him to become a doctor, and Valdemar attended medical school for a short time, but at age 24, he left to take a job as a technician for the Copenhagen Telephone Company. Poulsen’s first major invention was made while he was working for this telephone company. Some time during 1898, probably after reading a 10 year old article on magnetic sound recording by Oberlin Smith, Poulsen constructed a working model of a device to record sound magnetically on steel wire. He filed for his first patent on the device on 1 December 1898. Poulsen work on the recorder, called the telegraphone for several more years and soon teamed up with another engineer, Peder O. Pedersen. The two filed many more patents on improvements for the telegraphone, but left it to others to manufacture and sell them. Poulsen's interests had turned to the field of radio In the early 1900s, radio, or wireless as it was called, could only transmit telegraph code, not voice. To generate the bursts of radio waves that could be transmitted as Morse Code, experimenters typically used spark generators. Voice transmission using spark generators required that the spark be continuous, which was difficult to achieve. The one type of continuous spark generator available worked at low frequencies and could not transmit very far. In 1903 Poulsen developed an improved continuous arc transmitter that could operate at higher frequencies (up to 100 kHz) and it allowed the transmission of sounds up to 240 km (150 miles). For a few years, the Poulsen Arc was the most successful long-range type transmitter available. Many were sold throughout the world. By 1920, he had improved the basic design so that 1000 kW Poulsen Arc transmitters could transmit up to 4000 km (2,500 miles). Soon, however, vacuum tube transmitters made the Poulsen Arc obsolete. Parts of a large, war-surplus Poulsen arc transmitter built in California during World War I were used by the famous physicist Ernest Lawrence at the University of California, Berkeley to build the first large cyclotron in the 1930s. This cyclotron and others that followed it paved the way for discoveries in particle physics and the atomic bomb. 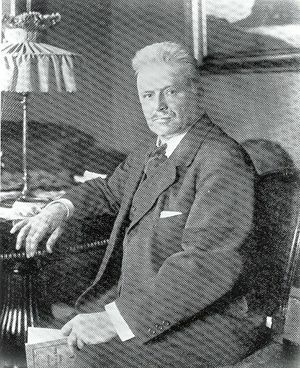 Poulsen died in 1942. This page was last edited on 1 March 2016, at 15:55.